David reveals Vicki’s location to Roger and Burke. Meanwhile, Matthew sharpens his axe, ready to kill Vicki. Josette’s ghost appears to Vicki to reassure her, and as Matthew begins his attack, the ghosts of Bill Malloy and the Widows (which sounds like a band name) arrive and frighten him to death, as he swings his weapon wildly. Roger and Burke burst into the Old House to find Matthew dead and Vicki in need of rescue. Josette’s ghost first appeared in full form in 102, and Bill Malloy appeared yesterday in 125... but those were appetizers compared to the main course in 126. 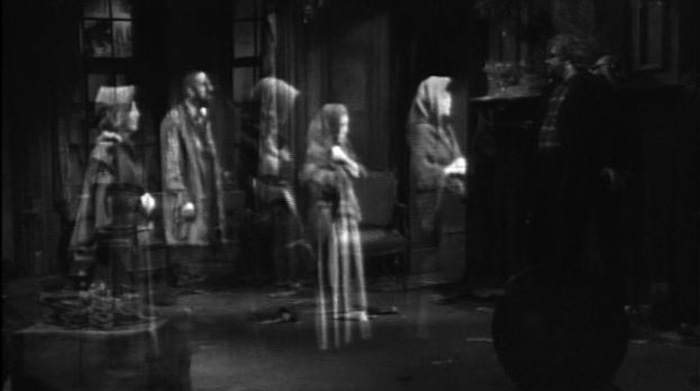 Really, until Quentin took over Collinwood and the show in early 1969, this episode might have been the high point for spectral apparitions on DS. It takes 125 episodes of getting it kinda right, but 126 is one of the most red letter installments in the series. 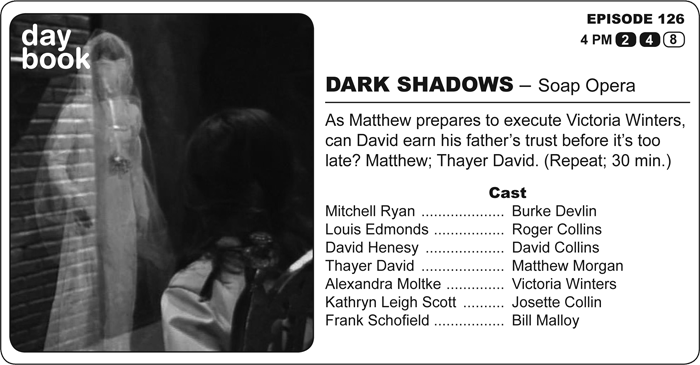 The program might have gone on the air on June 13, but it was on December 12 that cameras captured the first real episode of DARK SHADOWS. Not only do we get Matthew Morgan at his most blitheringly insane… not only do we get him casually grinding axes… not only do we get a damseled Vicki awaiting execution… not only do we get multiple ghosts attacking and killing a psychopath… but we also get Frank Schofield performing a seaweed-drenched musical number. Oh, and David’s father runs around the estate with a loaded shotgun… and Roger even tags along. I kid, I kid. On this day in 1966, the film version of Robert Bolt’s play, A MAN FOR ALL SEASONS, premiered. I prefer the later version with Charlton Heston, but few can fault the original, Academy Award-winning interpretation or the virile turn by Robert Shaw as the king it depicts.